In 2010, Reshma Thakkar, Founder of Made with a Purpose, met six warm and loving women who were sewing uniforms for the children of Sandipani Muni School in Vrindavan, India. These women had been working out of a classroom converted into a sewing center for years doing freelance work to make ends meet. It didn't take long for Reshma to fall in love with these women and partner with them to build the foundation of Made with a Purpose. Provide a stable, suitable source of income and an opportunity for a real career for underprivileged women and empower them to provide improved quality of life for their families. Create an environment where women feel financially safe and secure so they are able to build a better, brighter future for themselves, their children, their families and the community. We empower women by increasing self-worth and independence, and ultimately encourage secondary education for children, reduce child marriage rates, and empower families to get out of the cycle of poverty. Madhu is 45 years old, and has lived in Vrindavan for the past 15-16 years. She is a single mother to a daughter and 2 sons. Babita is 44 and a single mother to a lovely son. She works hard so that her son can become something and have a better life than she had. Neetu is a mother to a son and daughter. She is originally from Rajasthan, which is so fitting as she has the most colorful, jolly personality! Renu is a single mother to a son and daughter. 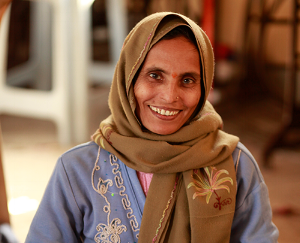 Her work at the sewing center provide her confidence, strength, and a support system. 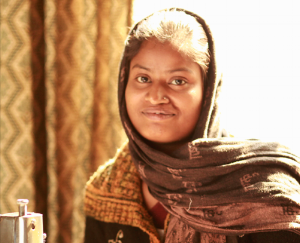 Our sewing center is located in Vrindavan, one of the holiest cities in all of India. Vrindavan is one of the major pilgrimage destinations for devotees of Lord Krishna, as the forests of Vrindavan are where Krishna spent the majority of his childhood. The city is full of amusing stories about Krishna's mischief and pranks. It seems everywhere you go, there is a tale about Krishna associated with it. Vrindavan is also where Krishna spent a lot of time with Radha, his female interest. The most common phrase spoken in this town is "Radhe Radhe" which praises the goddess Radha. It is said that you cannot enter Vrindavan without her permission and mercy. To win over the heart of Radha is to win over Krishna's love as he loves her more than anything else, and anything that pleases her, pleases him even more. Therefore, the residents and visitors in Vrindavan praise Radha and serve her even more than Lord Krishna himself. Every single tree, home, and shop in the town has her name on it. We are honored to be working with women in a city that worships a female deity. India’s women are her greatest asset. For this reason, Reshma's mission to empower women and educate girls is an incredibly important one. By creating an environment where both mothers and daughters feel safe and secure, Made With a Purpose takes steps to help families attain a brighter future. With ongoing support it is possible to educate girls, empower women, and eliminate child marriage…once and for all. Today, Reshma is thrilled to introduce the world to Made With a Purpose; a love child born from her life's work and inspirations.